Discussion in 'New England Patriots' started by Thrashen, Apr 30, 2018. Seriously bro? Name me one white wide receiver that the league considers a "deep threat"? How many years did it take Jordy to get that repsect? Hogan, who is still a football novice really, was considered by the media to be a #1 in the same way Kevin Curtis was a number 1. Well, that should be a compliment, but Curtis was called a joke by the league even after his legitimate breakout season. Hogan was never considered a number 1. At best he was a number 1 by proxy thanks to Edelman. No Edelman isn't a number one by them either, but it's hard to dog on a guy that puts up his numbers. Unless your Mike Furrey, but I digress. He was dogged on from beginning to end. Gordon, who, yes has talent, but has no internal discipline is the talk of the town right now. Sorry. I thought you were talking about the way he was viewed by the media. For what it’s worth, Shaq “Sumo” Mason will not play against the Packers today and Ted Karras will start in his place. This will give NE a 3/5 white OL. Also, with the addition of OL James Farentz to the active roster, the Pats now have 18 whites on the squad. Not sure how long he’ll stick around, though. I’m hoping that Rex returns from IR, more sumos get injured, Josh Gordon relapses, and LB injuries allow Simon to start and Calvin Munson to be promoted from the PS. Welcome back to practice, RB Rex Burkhead. Burkhead is eligible to play on Dec. 2 vs. Vikings. This means Burkhead takes the Patriots’ second and final designated to return IR spot. Confirms that LB Ja’Whaun Bentley won’t return until 2019 season. Oh man! You mean that because they are bringing that Burkhead fellow back we won’t be able to see the future HOF LB Ja’Whaun??? I am so bummed! I had already changed my name to “Ja’Whaun”. Kept “Barkevious” as my middle name, though! OL Schwenke was placed on IR. The Pats re-signed OT Matt Tobin. OL Cole Croston was cut, but he’s already apparently back with the team already. Perhaps a sign that Sumo Shaq Mason is still injured? In other good news, Burkhead and his wife welcomed their first child (named Jett) this past week! 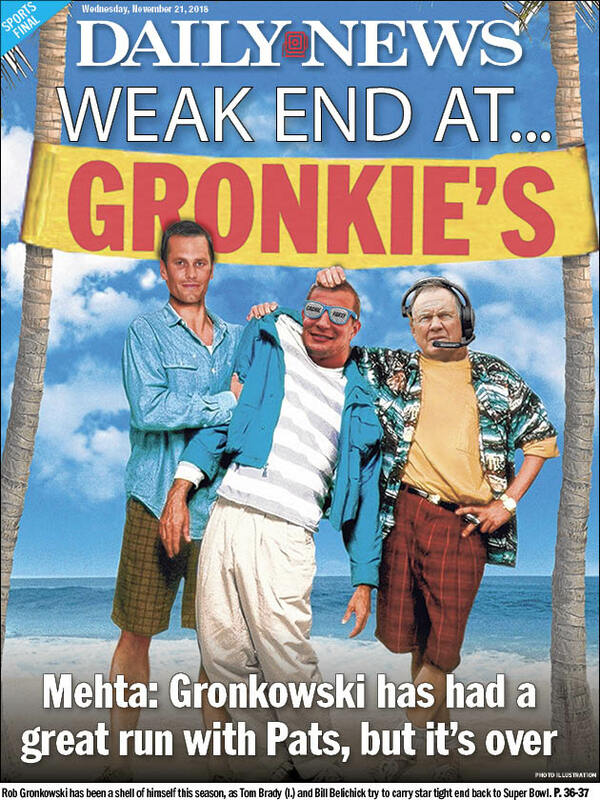 A Jew York Daily News writer (a puny little Indian named Manish Mehta) wrote a highly-insulting article about Gronkowski, saying that his career in NE is over, "he's toast," "he's a shell of his former self," "he looks like he running in mud," and "his body is 29 going on 92." In reality, Gronk is coming off a 1,000-yard season and 116-yard, 2 TD performance in the Superbowl several months ago. He'll return to action this week against the Jets, so hopefully the all-world TE is ready to dominate in the second half of the season. Good to hear, Thrashen. I am a bit torn on who to pull for when N.E. plays Minn but I've decided it's whoever needs the win the most from a playoff standpoint. Right now Minn needs it worse. As far as that weasel rat writing that pissy and denigrating article about Gronk, we just have to consider the source. He's a tool for the Enemy of our People...who (((they))) will never be! Street Shitter doesn't like gronk eh? "Running in mud." This is one of those derogatory phrases that are used for white players only. I remember Matt Jones as being described as looking like he was "running in molasess." You seldom hear black players being described that way. The anti-White narrative is off the charts evil. So far, I haven't personally encountered it. I need everyone's prayers for the day it may possibly happen. If it ever happens, the person who spews it will never, ever, ever forget the wrong guy they tried it on. I'm not saying or impying violence at all. I'm not a violent guy in the slightest. Verbally though, it will be unforgettable. Who does that racist Indian prick think he is? At least blacks have some legitimate NFL accomplishments to their name. Indians have nothing. He has no standing to talk garbage on anyone. When I was a nurse in the ER, the Indian doctors were the biggest headache to work with. Fresh off the boat street-sh***er "doctuhs" with their "degrees" from Sh**hole U. Medical School provided a constant source of stress, combined with the occasional laugh at their TIB. Woefully incompetent, couldn't understand them half the time, and the lot of them were perverted dirty old men. Unfortunately, the Pats released OT Matt Tobin (the only white tackle) to make room for Rex. The roster has 17 white players.